By Allan Fox: Trainer Abel Sanchez doesn’t see much point in his fighter IBO/WBA middleweight champion Gennady “GGG” Golovkin (33-0, 30 KOs) in moving up to the super middleweight division to face WBA 168lb champion Andre Ward, because once Golokvin beats him, he would have zero options for big fights in that weight class. There’s nobody else to fight at 168 now that Carl Froch and Mikkel Kessler have both retired, and the move would put Golovkin further away from the guys that he wants to fight like Floyd Mayweather Jr. Once Golovkin moves up to 168 to face Ward, it would make it impossible for him to get fights against guys like Mayweather. Sanchez is correct. Once Golovkin beatsWard, he’s basically run out of fights in the super middleweight division. There’s no money in a fight against guys like James DeGale, George Groves, Arthur Abraham or Badou Jack. You can’t sell those fights on HBO pay-per-view because the American boxing public doesn’t know who those fighters are. I’m talking about the casual fans. They don’t have any idea who DeGale, Groves or Jack is. It’ a dead end for Golovkin if he moves up to super middleweight to fight Ward, because the fight would be a one shot thing, and it likely won’t bring in big PPV numbers due Ward not having a big fan base. After that, Golovkin would find himself with no else to fight at 168 that the American boxing public cares about. Golovkin would then have to move back down in weight to middleweight to look to get whatever fights he can get. It would be a big waste of time for Golovkin. Golovkin and Ward are going in opposite directions right now in terms of popularity. By the time Golovkin gets finished facing the winner of the Saul “Canelo” Alvarez vs. Miguel Cotto fight, I don’t think there will be any common ground to try and make a fight between Golovkin and Ward. 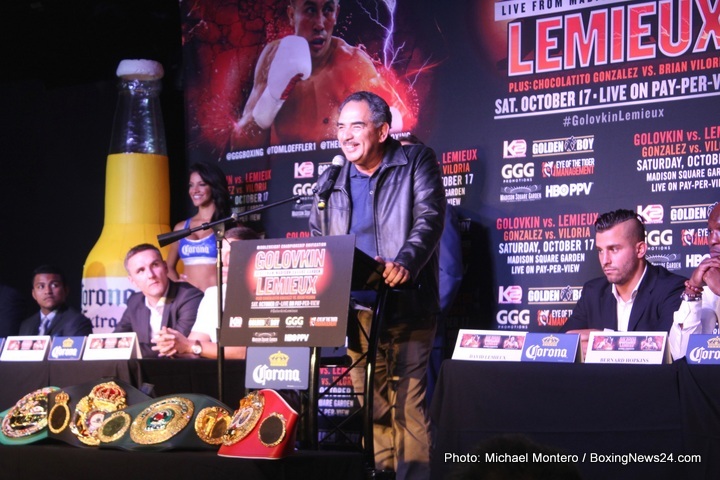 The power imbalance will be huge at that point if Golovkin beats Lemieux and the winner of the Cotto-Canelo fight. The only way I could see Ward getting a fight against Golovkin at that point is if he would agree to come down to 160 and take a split of 75-25. Golovkin would have the ability to ask for all of those things from Ward, and if he didn’t want to give it to him, he would be the one losing out, not Golovkin. It would be charity in my view for Golovkin to fight Ward at a catch-weight of 164 and a purse split of 50-50. I think it would be charity right now for Golovkin to give Ward those things because there’s already a huge power imbalance between the two fighters in terms of popularity. Golovkin is so modest that he doesn’t see it yet, but his promoter Tom Loeffler of K2 Promotions needs to see it and understand that his fighter is the A-side to the extreme in a fight against Ward. It’s already a huge imbalance due to Ward’s inactivity and his lack of interesting fights since he left the Super Six tournament four years ago in 2011. Besides that, Ward has a mugging style of fighting that isn’t particularly appealing for a lot of boxing fans to see. Ward likes to wrestle and hold onto his opponents in close, and that kind of MMA type thing is dull to watch unless you like watching MMA grappling at the standup position. Right now there would be no point in Golovkin giving Ward a 50-50 purse split or agreeing to fight him at a catch-weight of 164. If Loeffler was on his job, he would tell Ward that he can have the fight with Golovkin after the smoke clears in a year or two, after he clears out the middleweight division, and only if Ward is willing to fight Golovkin at 160 with a purse split of 75-25. I think the longer it goes the more of an imbalance there will be between the two fighters. Within two to three years, Golovkin will be able to ask for a huge purse split in his favor in a fight against Ward, and I don’t Ward would ever agree with that, especially if he’s still unbeaten. Looking at the guys that Ward is fighting like Paul Smith, he’s not likely to get any more popular than he is now. Ward could be fighting on the undercard of the Cotto-Canelo fight card on November 21st, but Ward’s rumored opponent in Marco Antonio Periban, a fighter not even ranked in the top 15 at 168. Periban was recently knocked out by James DeGale. It’s unclear why Ward would fight a guy like Periban, because he just finished taking a tune-up fight against Paul Smith. I don’t know that the World Boxing Association would even sanction a fight between Ward and Periban, unless it was a non-title fight without Ward’s 168lb WBA title on the line. But that would be Ward’s second straight non-title fight, and he hasn’t defended his WBA super middleweight title since 2013. I’m not sure how much longer the WBA will wait before they eventually strip Ward of his title for failing to defend it in a timely manner. Golovkin doesn’t really gain anything in fighting Ward now or later unless he’s run out of viable opponents at 160, and Ward is willing to melt down to 160 and take a purse split that is heavily in Golovkin’s favor.